This twill lab coat is 38" long. It has 4 patch pockets, an inside pocket, and a velcro closure on right pocket. It also has a set-in back belt and side access. 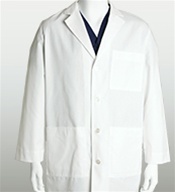 Barco Lab Coats come from a tradition of fashion and quality. These lab coats are durable, stain resistant and high performance. Available in white only.